Ian was at Pickering today on training for driving on the NYMR, so I have been asked to step in to cover in his absence. There were 5 in attendance Bill, Trevor, Peter, Rachel, & Andy. It has been a slow day as far as progress is concerned everything was hard work. 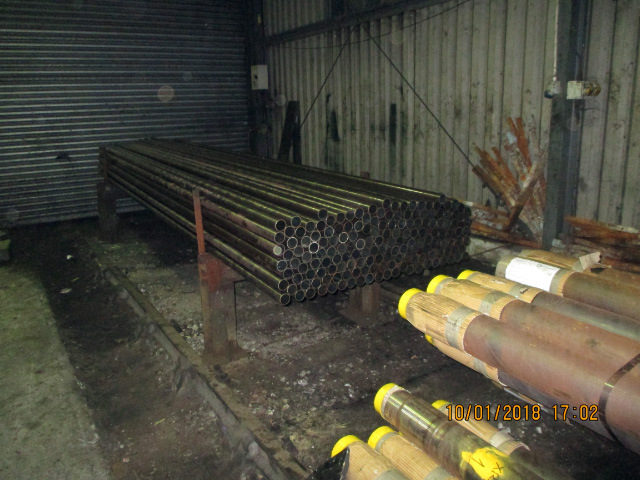 The new small tubes that arrived Tuesday evening had been stacked up inside Deviation shed, this allowed one end to be annealed today in accordance with Marks instructions. The last draw bar pin has been cleaned ready for NDT inspection which will now be done on Monday. All pins & links have been laid out in readiness. 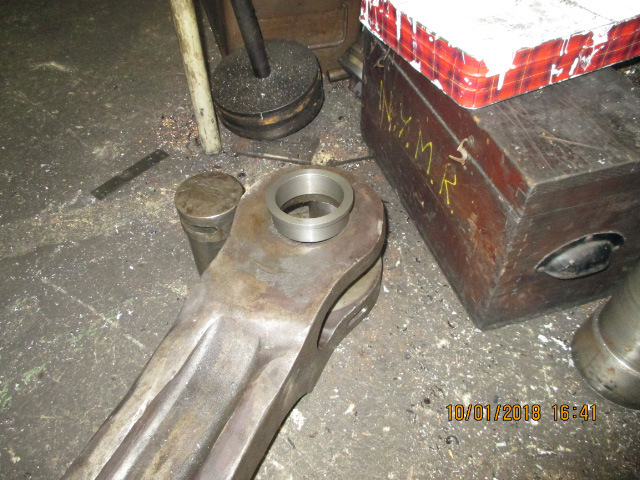 The two new brake hanger pins made by M-Machine last week were fitted to the loco, as the pin size has increased the washers had to be machined to fit them. New taper pins for the brake table end collars were obtained from the stores & loose fitted to prevent them getting lost. The new gradient pin bush for the front left rod has been pressed in & the rod fitted onto the front wheel. The loco will now have to be jacked up to line everything up, then all the end caps can be pinned on the left rod. Ian reports a grey damp day at Grosmont (bit like Sydney at the moment), but not as cold as last Saturday, with Steve Hyman, Derek Shorten, Roy Marshall, Jon Bradley, Ian McCall, Bill Dobson and Ian himself. Cups of tea all round to start although Bill wasn't very well with possibly a touch of flu. One mouse removed to the bin. Barney had told Ian that the NDT man was coming to Grosmont on Friday, so it was decided to clean all the drawbar components ready for testing in my absence. This was quite a task as they had been painted and were covered in grease, all of which had to be removed to enable testing to be done. Steve got stuck into the drawbar, while Jon and Ian McC took the safety links and pins down to the MPD to clean and glass blast. All the draw bar equipment is now set out ready for NDT inspection on the bench at the back of No 8 road. In Piget's absence on holiday, Barney is aware. Ian P and Bill continued with the right hand slide bar alignment, which was finally completed later in the afternoon. Roy spent quite some time continuing to clean the small tube holes in the smoke box and also removed some of the copper ferrules from the firebox tube plate. Jon took the whistle blank down to the MPD and got the holes drilled out to the correct size and then fitted it to the boiler: the whistle is now blanked off. Owain has completed the left hand gradient pin bush and this now requires pressing in so the rod can be fitted to the locomotive. Owain may, if he has time, press the bush in for us. Andy Lowes is aware of this, and there is a packing piece made to fit between the fork of the rod when the bush is pressed in (see photo). Lunch was had in Deviation shed with Derek brewing up. Norman's stove was tried, but there is no adjustment for the wick as it is jammed and it will sheer off if any force is used to try and adjust it . The flames were quite aggressive, and, unless Norman wants it back, it may have to go in the skip. The small tubes arrived on Tuesday afternoon, so a couple of trestles were set up on No 6 road. Mark O'Brien and Duncan Jackson brought them up with the Tele Handler and they are now stacked on the trestles (see photo). Our team then level ended them ready for annealing on Saturday. Mark O'Brien is the duty fitter on Saturday and he will instruct how he wants them annealing. As expected, it is very busy in the MPD at the moment with carriage, DMU and diesel loco repairs, never mind most of the steam fleet on maintenance/repair. The J72 steam brake was given to Steve Andrews for repair/refurbishment. Bill Putman from Ryedale Engineers hopes to return with colleagues and a Stihl saw and collect his Q6 tubes next Wednesday, 17 January. A year of winter maintenance! Saturday was a cold dull morning with two working parties in Deviation Shed. Paul Middleton, with his team of David McEwan, Matt Fisher, Beth Kennerley and, all the way from the Netherlands, Ben Heerink, were working on Paul's Cockerill Tram loco Lucie, No 1625. Our working party was formed ofTrevor Wilford, Peter Ellis, Bill Dobson, Ian and later, Nigel Hall who brought the J72 steam brake valve for overhaul, to be collected by Steve Andrews. No mice on Saturday, the traps were forlorn, not a common sight but we don't know the reason why - perhaps Steve Hymans blocking of the hole in the North wall has done the trick? Cups of tea first thing to warm everyone up and some chit chat and job planning before work commenced with Trevor setting up the oxy bottle equipment, then cutting some safety valve blanks to size. One smaller blank for the whistle requires the holes drilling out larger to fit the studs and this is a job to be attempted on Wednesday. Peter was busy making shims for the right hand side slide bar alignment, while Ian fitted the right hand side little end oil pot to the crosshead . Bill spent most of the day jacking and measuring up the right hand slide bar tolerance, fitting shims trying to get the alignment right, with Ian assisting . This work is taking some time but hopefully it will be completed on Wednesday. Lunch was had in the SNG A4 cabin which was warm and quite cosy. Although the sun had come out, it was too cold in Deviation Shed to have the lunch break there. After lunch, Trevor and Peter, with Nigel's assistance, removed the drawbar from the tender for NDT inspection. This job took all afternoon as there is a metal plate on the tender floor which proved very stubborn to remove. The big nut under the tender required slackening, then the shovelling plate had to be removed. Eventually the drawbar was removed and put on the bench at the back of No 8 road ready for cleaning and NDT particle testing. As I have legged it to Oz for a few weeks (where it is pouring with rain but still in the upper 20s and the air conditioning is on! ), Ian is going to see if he can be trained on NDT inspection. Bill and Nigel moved the Velocipede in front of 80135 to give more room for the small tube delivery, which should have been last Friday but was now expected to be delivered yesterday or today. Afternoon tea break was shared with Paul and his team, giving Nigel a large amount of washing up. In addition, many thanks to Norman Crockit for the loan of his paraffin stove which Trevor delivered on Saturday. Hopefully that will keep those not Down Under, nice and warm. A very cold sunny crisp day at Grosmont yesterday with Trevor Wilford, Peter Ellis, Andy and Joan Lowes, Steve Hyman, Bill Dobson, Ian Pearson and myself. Jon Bradley called in very briefly in the afternoon to check we hadn't frozen to death! Trevor and Peter, with assistance from Andy, completed the repairs to the fall plate with welding done by Trevor. It was then refitted to the locomotive. Steve cleaned the rough edges on the hexagonal parts of the steam heat reducing valve and the valve was put back upstairs in No 7 bay. He also brought a piece of plywood from home to cover a possible mouse entry hole about 10"x 8" inside the workshop to the left of the top door in the corner of the rear wall: this is now sealed up and we will see if it has the desired effect. Andy fitted the blower valve. This took some time as it required a copper washer which was acquired from the MPD stores but this then had to be cut to size on our lathe and then annealed. These jobs sometimes take hours to complete. Bill and Ian, with assistance from Peter, continued with the left hand slide bar alignment. A new thicker shim was made with the stud holes cut out with a circular cutter by Owain at the MPD, but, again, this job is still to complete next time. I arrived a little later than the rest but am now able to wear my safety boots and got to work on the left hand connecting rod. This was cleaned and the NDT dye penetration process completed with no cracks to report. Joan kept us in tea ,coffee, cake and biscuits during the day and lunch was had in the A4 SNG cabin - nice and cosy! During our lunch break there was a discussion on heat in our Shed. Piglet (who was working on Lucia in the Shed) had loaned us a mobile diesel heater to take the chill off today, but with the doors open, it was trying to warm up the whole of North Yorkshire and did not have much success. And we had the doors open because, with trains running (44806 and the DMU), there were quite a few visitors around and we encouraged them to come in and have a chat and a look round - and most importantly, drop their loose change in the donation box which a lot of them did. We are looking for a coal fired stove or similar to be installed in Deviation Shed in the corner next to the paint locker, which will have to moved. If anyone knows of a suitable stove going cheap, please contact Ian. Otherwise, Trevor might have to run one up. Apart from warming the (mainly) geriatric workforce, there was much discussion about being able to cook Parmos on one. If you don't know what a Parmo is, Ian explained that it is a Teesside speciality of chicken and cheese. Nicos Harris, a chef with the American army in WW2, was wounded in France and brought to UK to be treated in a British hospital. He moved to Middlesbrough and opened a restaurant in Linthorpe Road where he created the Parmo! - lovely grub according to Ian from his vast experience of them. The new elected Mayor for the Teesside Joint Authority is now trying to get protected name status for the Parmo, so if successful it will join Wensleydale cheese, Melton Mowbray pork pies and Parma ham on the world list of specialist foods. However, enough of this food talk. No working party tomorrow. The next one is on Wednesday 3 January, so from Ian and myself, thanks for all the efforts in 2017, and all the best to everyone for the New Year, with 2018 hopefully seeing both the Q6 and J27 (or T2 and P3 to our more aged readers) back in operation on the Moors. A grey damp but mild morning with a one heavy shower early on at Grosmont on Wednesday. With Bill Dobson, Jon Bradley, Steve Hyman, Nigel Hall, Derek Shorten, and Ian Pearson. I only managed the morning as I was on a to be strictly enforced half day pass out. Today was the last Santas and dining trains for the Christmas period. Next week will see the start of the winter timetable with trains running from Boxing Day until New Years Day when 44806 is likely to see its final trips before withdrawal for its 10 year overhaul. Another mouse to remove from the trap first job, then the usual cuppa and some idle chit chat. Bill drew up the job list for the day which saw Jon and Nigel cleaning out the foundation ring before getting the hose connected up and giving the whole inner firebox and foundation ring a good washout. Derek cleaned the right hand con rod ready for NDT dye penetration which I completed - it was OK - before having to leave immediately after lunch . Hopefully we will get the left one done next week. I also carried out the monthly, and, as it was December, annual, check on the defibrillator. The completed forms will be sent to Martin Lloyd. Steve was given the job of blanking off the safety valves and whistle mounts, but looking for blanks in our workshop was a bit of a challenge. He could only find one that was any good for one of the safety valve mounts but managed to borrow another one from the MPD: both safety valve mounts are now blanked off. Steve is going to see if he can find a whistle blanking plate at Hopetown. Bill and Ian spent all day working on the left hand crosshead and slide bar clearance. This is still ongoing, with quite a bit of time spent remaking shims. Lunch today was in Deviation shed with Derek kindly brewing tea and washing the pots. Nigel has mounted a new coat hanger and key holder on one of the roof beams just inside the workshop from the top entrance on the right hand side. The last of the mince pies were consumed with the 3 o'clock tea break. Just before locking up, Piglet and Mark came in with another regulator handle which was tried on the shaft but it was slacker than our own! So will need to try another one. No working party on tomorrow (Saturday). The next one will be on Thursday 28th December when the boiler inspector is due to carry out his internal inspection of the boiler. So everyone have a good Christmas and we will hopefully see you on the 28th. Ian reports a very cold bright crisp day at Grosmont yesterday, with 3 Steam and 1 Diesel locomotives working Santa Specials and Dining trains, and Peter Ellis, Trevor Wilford, Dave Donegan, JV Ethan Humble and Ian himself. One mouse in the trap again which Ethan disposed of, then the usual brew of tea with mince pies. Peter took Ethan under his wing, showing him the skills of bending and fitting new small copper pipes. These are attached to the brass oil boxes and a flexi pipe and adaptor then screwed into the top of the axle box to allow oil to be fed to the journals. This was done to the right hand driver. This completed the pipe work on the axle boxes. Dave refitted the vacuum pipe and bracket - not cross threaded this time! It was decided not to fit the front steam heat pipe because it will obstruct the fitting of the left hand valve cover at a later date. Trevor fitted the refurbished right hand bracket to the fall plate, then the tender was moved up to the locomotive to see how the fall plate laid on it. The left side was looking a bit out of line, and that bracket was in rather poor condition although not broken. It was decided to take the left side bracket off and Trevor will refurbish it at Hopetown next week. The fall plate was then removed from the cab and stored on the bench opposite the loco. The regulator rod has been moved to behind the seat and put on a stand to allow access for the fitting of another regulator handle when Piglet get us one from his stockpile! The Velocipede was moved onto No 7 Road to allow space for delivery of the small tubes which are expected this week. Gordon Wells asked for another 5 tubes which Dave cut to size and stored with the others outside. These are for a job at Pickering moving a coach body. The old K1 regulator rod was removed to our scrap heap outside Deviation Shed. Lunch was held in the A4 cabin, a much warmer venue. Ethan made our final cuppa in the afternoon, with which consumption of a few more mince pies was managed. Next working party will be on Wednesday 20th December, then a special one on the following Thursday 28th December to help get rid of all that turkey and Christmas pud. The Railway will be running Santa Specials on the 20th, and its winter timetable on the 28th, along with the diner, so watch out for car parking, but plenty of trains to watch. A cold damp miserable morning to start with at Grosmont, but it did brighten up later on before pouring with rain at lunch time. That dried up and the sun shone for the rest of the day but it was still very cold. There were four engines in steam throughout the day so it all added to the atmospherics. No mice to report. Nigel Hall, Roy Marshall, Jon Bradley and Ian Pearson were present. Bill Dobson popped in for a brief spell early on and, because of pressing family matters, I was only able to call in for a cup of tea and lunch, which was held in the workshop today - too cold in the shed and the A4 cabin was full. Nigel was on needle gun duties, but, unfortunately, none of our needle guns would work. So Ian took one of them to bits, cleaned it, put it back together, but it still would not work. Nigel had started to strip another gun when Mark O' Brien came into the workshop looking for an adapter for a drill, and he took over stripping down the needle gun. He managed to repair it but it did take some time, so many thanks to Mark for his help. During the morning, Bill Putnam from the Ryedale Society of Model Engineers arrived to collect the 50 Q6 tubes that had been put on one side for them. Unfortunately he had underestimated their length and they would not fit on his trailer, so he will be back later to try again. After lunch, Nigel needle gunned inside the smokebox and used Henry the vacuum cleaner to clear the rust and scale. Jon and Roy fitted the front guard irons. Roy also secured the right piston packing cover. Jon and Ian then started to fit the front part of the vacuum pipe. This they did, but, for some reason, the union, when screwed onto the vacuum main pipe which runs between the cylinder casting, looked to be very slightly at an oblique angle. As it was getting near home time it was unscrewed and left to have another go on Saturday. There will be a working party on Saturday and another on Wednesday 20th, but after that we will have a break until Wednesday 3 January 2018 when we will return to work, suitably refreshed and re-invigorated. But please don't bring any more biscuits, cake, or mince pies. We have lots, and also a tub of Quality Street kindly given by Joan and Andy last week, so there is plenty to munch on. Ian reports a bitterly cold but fine day, 'minus two degrees', at Grosmont (and it wasn't any warmer at St James Park last night), with Joan and Andy Lowes, Peter Ellis, Alan Hardie and Ian himself. It was so cold they used the A4 cabin for the usual cuppa, lunch and afternoon tea: it was much more comfortable and warm! First of all, Ian brought 15 of the small tubes into Deviation Shed for Peter cut down to 9' 6" for Gordon Wells. These were then put back outside the Shed and the off cuts put with the scrap pile. Andy has measured up the valve ports to allow him to set the valve heads which are at Hopetown. Joan had a good clear up on the workshop bench with some item being removed and put upstairs, and bits of small scrap in a bin marked scrap. After starting the compressor, Alan cleaned all the remaining holes in the tube plate and completed the bottom holes by going into the boiler to gain a better access. Andy and Peter were working on the oil pipes to the driving axle boxes: the left hand side is now fitted and completed, but more pipe work and fitting is to be done by Peter next Saturday on the right hand side. The shed cleaners came in to see if we had any jobs for them so Ian got them to remove the scrap tubes from the front side of No 6 Road to the scrap pile outside. Later on Alan got a start needle gunning the front tube plate above the concrete. Then it was time to get cleared up as they wanted to be away home about 3pm so the Shed was locked up, a cup of tea in the A4 cabin, and then depart. Another working party on Wednesday, again, weather permitting, when Bill Putman is planning to be calling at about 11am to collect the 50 small tubes put aside for the Ryedale Society of Model Engineers, and for which they have made a donation to the Q6 fund. On the Q6 generally, Bill's update for the Social meeting last Friday was that the new small tubes had been ordered and were due for delivery before Christmas - possibly by the end of next week. The boiler inspector is due to visit in the first week of the New Year to carry out his internal inspection of the boiler, subject to which, Bill has pencilled in the hydraulic for the last week in January. Fingers crossed, but just still on schedule for 19 March target date for completion. A lot milder today at Grosmont but slightly overcast with occasional bursts of sunshine. Another big attendance with Ian Pearson, Jon Bradley, Alan Hardie, Nigel Hall, Derek Shorten, Roy Marshall, Nick Raithby and myself. Nick lives in Newark and travelled travelled up to York by train from Newark (about 50 minutes) and I picked him up from the station, brought him to Grosmont and then dropped him back in the evening for his train home. Ian reports that December has arrived with a sting, with snow on the Moors and bitterly cold. Fortunately the roads were clear on the Middlesbrough side so no traffic hold ups, although lots of pictures in the papers of deep snow at Goathland and in the Whitby area. Santa Specials have started and Grosmont station is a hive of activity again. Only four attended yesterday, with Peter Ellis, Trevor Wilford, Dave Donegan and Ian. After removing another mouse from the trap, the usual cuppa was had to warm up, then down to work. The first job was to move all the small boiler tubes from No 6 road in Deviation Shed to outside so they can be easily loaded onto a vehicle for the scrap yard. After removing about a third of them, apparently everyone was getting a bit tired, so Ian went down to the MPD where there was a large team of cleaners working in the shed. With the permission of the duty fitter, he managed to borrow five young cleaners to help move the tubes. This proved to be a success and they had all the tubes removed in no time at all - well done and many thanks to them. The tubes have been stacked between No 10 & 11 road to the east side of Deviation Shed. Peter cleared all the scale that had been left in the smoke box from last Wednesday, which was another barrow load. Dave, Trevor and Ian moved the tender forward to see whether the fall plate required any more levelling when it sat on the tender plate. Unfortunately, the welding repair to the hinge broke, so Trevor is going to make a new hinge at Hopetown next week. The scaffolding from the front of the smoke box was dismantled and taken back to the boiler shop . Lunch was had in Deviation Shed. After lunch, the right hand cylinder cover was fitted by Trevor, Dave and Ian with the aid of the hydraulic lifting table. All the nuts and washers have been put on the studs, but not tightened up yet. Peter started working on the axle box lubrication pipes and fittings. With the aid of a special thread cutting tool loaned to us by Andy Lowes, Peter was able to dress the damaged thread for the adaptor to be screwed into the right hand outer leading axle box top where the oil is fed to the bearing via a flexible pipe from a brass oil box above the frames. Both leading axle boxes are now connected up to the brass boxes above the frames. Thanks to Andy for loan of the thread cutter: Peter will return it to you . Dave has fitted the left hand piston packing. Then, about 2.30, four Junior Volunteers came into the Shed asking if they could help out. They had been on an NYMR induction course which had just finished. 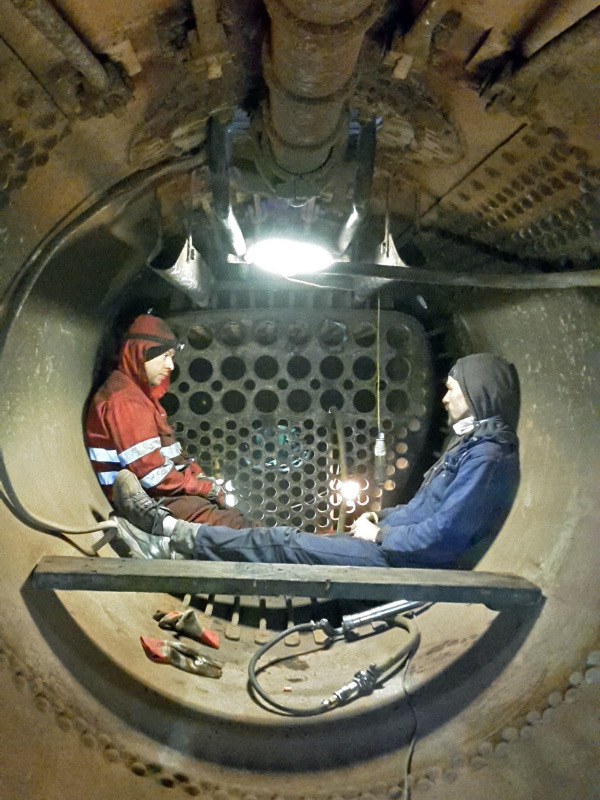 We were looking for some small person to go in the boiler barrel and give it a sweep out, and two of them, Finn Allen and Ed Murray, couldn't wait to get in. Armed with brushes, shovels and buckets, the lights were switched on, dust masks were given to the lads, and in they went. After about twenty minutes they were out of the boiler barrel with only a small amount of dust: there was probably more dust over them, but they enjoyed it! They also cleared some small pieces of tubes from inside the fire box which was taken up to the scrap pile outside Deviation Shed. There is quite a bit of boiler tube scrap laid about in Deviation Shed which has been there for seeming years. Unless anyone objects and lays claim to it, we will take that to the scrap yard, along with the old K1 regulator rod, when we take the small tubes from the Q6. Working party next Wednesday, weather permitting, to try and maintain progress. Forecast is for a mils say, to be followed by the return of winter.